Hi, I am Jacqueline Rocca OHara of Access1Source, and I am proud to introduce Workforce Management Clock! Workforce Management Clock reduces labor costs one punch at a time. PunchLogic prevents punch errors and cuts out duplicate punches to considerably reduce admin edits. By improving the accuracy of important timekeeping data, employers are better protected in case of an audit. All this means you can sleep well at night knowing you have accurate, audit-ready timekeeping data that stands up to compliance requirements. Break tracking gives employees dedicated break buttons and curtails staff member confusion when punching at the clock. By ensuring breaks are paid based upon hours worked, this tool guards against overpayment for unauthorized breaks. New punch types enable rapid identification of work and rest periods. 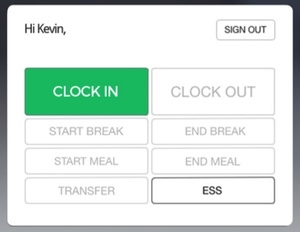 Employees can identify break, meal, and transfer buttons at a glance. With improved tracking of departments and job codes, supervisors can make more intelligent determinations about scheduling, project management, and resource allocation. Workforce Management Clock can be configured to best serve the individual needs of any business which means you’ll spend less time assembling the perfect clocking system for your business. Out-of-the-box presets make setting up easy, and configurable settings allow you to streamline a custom experience for your employees. Employers can easily create a customized clock experience and update it as their organization grows. Workforce Management Clock expedites the way managers track employee hours and helps curb labor costs, one punch at a time.